I don’t know if it’s being a woman, whether you are in ministry or not, we have tendencies to feel responsible for things that are not our responsibility. When I attend homeschool conferences, a common saying is that “Homeschool moms go to bed at night worrying about whether they are doing enough to help make their kids successful for life.” I feel like that about marriage, ministry, parenting, finances, and friendships, A LOT. I understand the character trait of responsibility is very important, but how many of our burdens come from taking responsibility away from our husbands (as head of the home) or away from God(as the Shepherd of our souls)? We feel responsible for people when they do not get saved. We feel responsible for staffing ministries when at times people are not even growing in the Lord and ready for the responsibilities we try to plug them into. We feel responsible when our children do not get saved at a young age even though we are teaching them regularly about salvation. We feel responsible when people do not respond the way we think they should. We feel responsible for making people happy all the time when the reality is, it’s their choice whether they want to be happy or not. Let’s stop feeling responsible for every little thing in life, because God has bigger plans! Things are going to change, people are going to be and do whatever they want to be. God may not be working things out in your “favor” because He has an alternative plan. On the morning we were set to leave on our vacation I lost it. You know, one of those, “I can’t handle this,” losing it scenarios. The previous two weeks before our vacation had been jam-packed and honestly, it was just too much for me even with my husband there bearing the load too. We got out on the road two hours later than we planned because we had so many loose ends to tie up before we headed out-of-town. The pressure was bearing down on my soul. It is my responsibility to make sure that everything goes right on this trip. If I don’t have things ready in the car for the kids to do then it will be my fault if they get bored and are unhappy. If things had been different, then I could have gotten everything taken care of ahead of time. If I don’t get the snacks and lunch ready in the cooler then you (husband) will feel like you have to spend money. It is my responsibility to make sure our spending money lasts. I wish we had not done ______________ so that I could have gotten these things done. Hours later in the car, after finally feeling a little more free from the burdens I placed on my shoulders, God began convicting me. He reminded me that out of the abundance of the heart, the mouth speaketh (Luke 6:45). I was trying to take everything out of God’s hands and was making everything personal. It wasn’t just that I had an “I” attitude, but it was bearing the weight of the situation as if everyone’s happiness was dependent upon me and what I did or did not do. We do not have the ability to make people be happy in life. That was not my responsibility. I “know” that but my heart was not remembering at the time because my fear of disappointing people was in the way. God also prodded me about not putting Him in the equation of our lives first. In those extremely stressful moments, I could not get past my feelings or my thoughts. They were holding me back from the truth of God’s Word that my husband had even taught about in our Sunday School Class the day before. The lesson was titled, How To Deal With Stress. That is sort of ironic, isn’t it? Or does God know our future ahead of time and give us what we need to be able to deal with the circumstances that come along? I failed His test. Two major things were wrong in those heavily self-burdening moments. 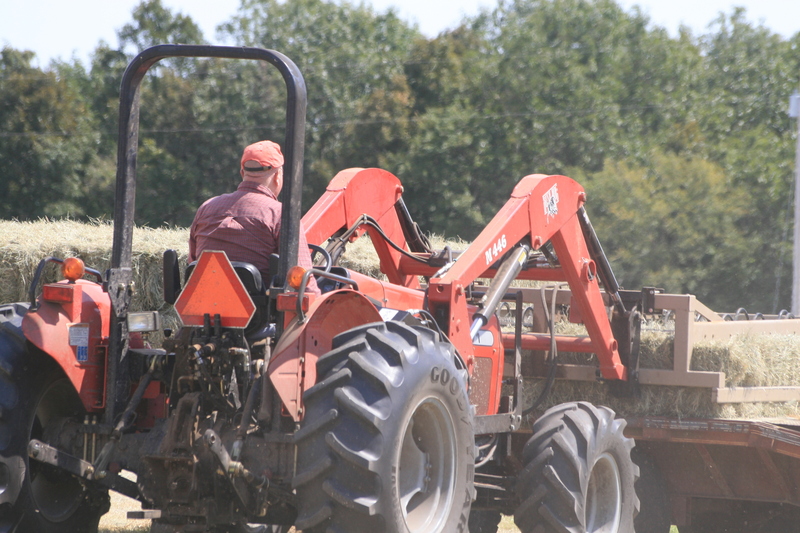 Farmer loading hay bales onto a trailer. 1. I was not casting my cares upon the Lord. Christ calls us to exchange our burdens for His, because they are light. I Peter 5:7 says, “Casting all your care upon him; for he careth for you.” I love how this verse describes giving our cares to the Lord as “casting” them upon Him, it’s like how you see farmers loading heavy hay bales into the back of a large trailer and driving away with the load. We have this promise that He will take these burdens of life and sins by taking care of them for us. Why? Because He cares for us. When we are struggling with stress one of the biggest things we believe is that we are alone and no one cares. We have a promise that God does care, ALWAYS! 2. I did not consider my stress to not trust the Lord as a sin, that had a temptation that I fell for. If you don’t understand, then I will say it like this: In temptation of any sin, God promises in I Corinthians 10:13, that He will always make a way of escape to those who are His children. He provides the way to escape, we just have to look for it and use that escape route. When I committed the sin of worry and distrust toward the Lord, then there was a way of escape from my wrong thoughts and fears somewhere along the way. The escape should have been taken to keep me from a heart filled with worry that burst forth with those things that came out of my mouth the morning of our vacation. Take the time when you feel like your eyeballs are going to explode because you cannot possibly handle one more stress or frustration, sit down and start casting every. single. thing. over to the Lord. Then, take the responsibility off of yourself. Things that you cannot handle, like the timing of situations, responses, spiritual matters, etc. should be cast where they belong on the Lord. Talk to God first when you start to notice those things are bothering you, don’t wait until the load is too great. That is why we need to pray without ceasing (I Thessalonians 5:17). It is a little hilarious that as I was scrolling through Facebook the night this all occurred and saw a saying that said, “Give it to God, and go to sleep.” That’s basically it in a nutshell. Don’t take responsibility for everything, give it to God, and go to sleep. I pray that next time I will not take on God’s responsibilities, and I will trust better than I did that day. There are times you just never know the things in your heart until they come out of your mouth. So listen for the things in your heart as you speak and ask the Lord to help you recognize the way of escape when you are burdened down and prone to worry. He’s there and He will take that load!